It's called Magenta... but it's a blueish grey colour. Acustica Audio has already released some pretty fine EQ plugins, so when it says that Magenta is "the best mastering equalizer that we have ever designed," we're ready to be impressed. This 2-channel, 4-band parametric device is inspired by a famous hardware EQ with a stepped frequency selector. There's a preamp section, too. Interestingly, Acustica is happy to point out that its software isn't known for its CPU efficiency or low latency, but does claim that its "brute force" modelling method delivers incredible sound. 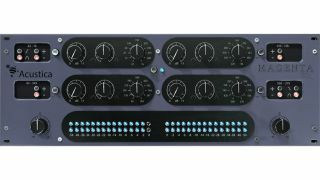 The Magenta mastering EQ is set to be released on 1 October, but is available for pre-order from the Acustica Audio website priced at €125 (the regular price is €149). It's compatible with PC and Mac and comes in 32/64-bit VST/AU formats.